Our database ist not available online for the moment. We are working on acomfortable solution. Until then you can contact us by e-mail to find out more about what’s available at the Jazzinstitut’s archive. 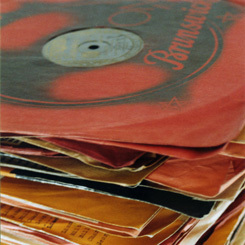 Our database allows you to get a overview of the recordings (cds, vinyls, 78RPMs) in the archive of the Jazzinstitut. While we may hold a total of about 80,000 records in all formats, about half of these have been indexed so far. We have also indexed all 78-RPM (shellac) recordings in the archive of the Jazzinstitut. The rest of the LPs for our blues, gospel, rock, jazz & lyric collection as well as recordings released under the name of musicians from countries not listed above whill be entered into our database soon. Our database contains a mere listing of what we have. It is not meant to be a discography. We do not list the titles, personel and recording dates, as this information can be found in commercially available discographies. You can copy recordings at the Jazzinstitut, however only in reduced MP3 formats and only such recordings that are not at the moment available commercially. This database is a “work in progress”: We continually add new material; we also correct wrong entries as soon as we notice any mistakes. The record collection in the archive of the Jazzinstitut is far from complete. However it covers a most stylistic directions of the music. It is not a “best of” but a survey of what has been recorded, whether highlight or mediocre, whether successful or experiment without results, whether swinging mainstream or cutting-edge between jazz and other genres. The collection was based on Joachimk Ernst Berendt’s archive, but has since then grown and now comprises many private collections as well as recordings donated by record labels or musicians. We especially urge German record labels to keep their releases updated in our archive. After all, while we are the most important information center for musicians, promoters, journalists, researchers as well as jazz fans, we can only know about what has been released if we have seen and heard the new releases. If you are missing anything, please feel free to add to our collection by donating either historical or new recordings not yet listed here. We have many volunteers who help us indexing our record collection. Our current volunteer staff caring about our record archive consists of Rainer Grobe, Helmut Lücke and Günter Schapka. The online datebase was put together by Emmanuel Bechtold during his practical course from Darmstadt College (h_da) at the Jazzinstitut Darmstadt.